I’ve been a fan of Chapstick since I was a kid–it was sort of my first “beauty” product. Cherry was my favorite. I still love that I just ate a Popsicle on the front porch shade it leaves on your lips. But just like the rest of us, Chapstick is all grown up. 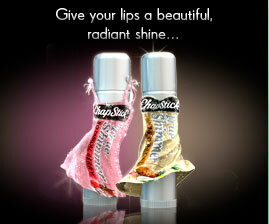 And while Cherry remains a classic, Chapstick has a whole new line of lip balms: True Shimmer. I was lucky enough to try out all four scents: Botanical Berry and Tropical, which are out now, and Peppermint Rush and Blended Fruit Sherbet, which will be available August, 2009. Botanical Berry is a pink shade and smells like mixed berries. Tropical is white and smells like a pina colada for your lips. Peppermint Rush is my favorite. It’s a blue color and leaves a cool minty sensation on your lips. It’s addictive! I can’t stop putting this stuff on. Blended Fruit Sherbet is a purple shade and smells like fruit punch. This is my least favorite of the bunch because the scent is a little overwhelming. Funny! Well, everyone has different tastes, that’s for sure.